হোম ব্যাংকিং ব্যাংক ড্রাফট কি? Bank Draft is an order to pay money drawn by an office of a bank upon another office of the same bank for a sum of money payable to order or demand. An instrument issued by one branch of a bank on another branch of the bank containing an order to pay a certain sum on demand to the person named on the draft. 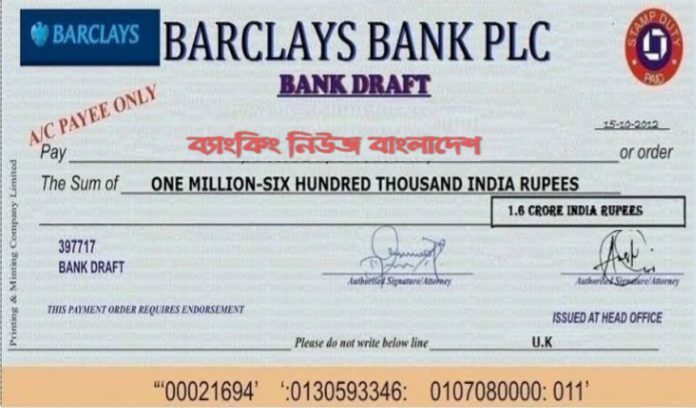 bank draft (also ‘banker’s draft) a cheque paid by a bank to another bank or to a particular person or organization. Bank draft (banker’s cheque; banker’s draft) A cheque drawn by a bank on itself or its agent. A bank draft is an instrument like cheque drawn by a bank on one of its own branches or correspondents, requesting the latter to pay the Specified sum of money to the person named in the draft. A bank draft is a payment on behalf of a payer that is guaranteed by the issuing bank.